The Dependaplast Washproof Plasters Refill Pack makes for the perfect backup stock to ensure that you keep your British Standard 8599-1 workplace first aid kit fully stocked up. The refill is supplied in a pre-packed dispenser box for easy and practical storage. The plaster's adhesive is made from zinc oxide, which ensures that it sticks firmly in place once applied, however still comes off neatly so that it doesn't cause any harm to injuries or leave any unsightly plaster marks. All of the Washproof Plasters are individually wrapped to guarantee sterility, and are made from latex-free adhesive to avoid any reactions to the skin, making them suitable for even the most sensitive skin, with a rayon contact layer to provide cushioned protection to cuts. The plasters are available to purchase as a minimum of five boxes per order, each containing 40 plasters, leaving you safe in the knowledge that you won't be running out in a hurry. These packs are suitable to store in the Small Workplace First Aid Kit to ensure that spare plasters are always at hand. 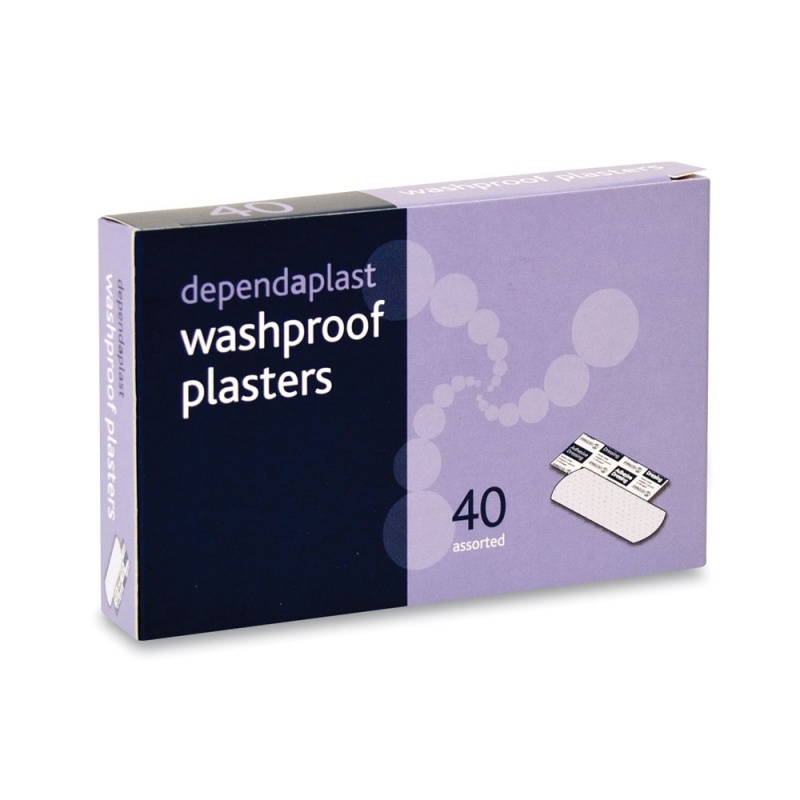 The Dependaplast Washproof Plasters Refill Pack is usually dispatched via First Class Royal Mail and delivery should be within 1 to 3 working days.